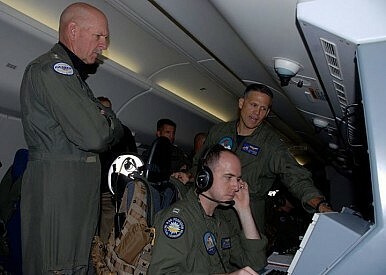 Adm. Scott Swift, left, commander of U.S. Pacific Fleet, looks on during a seven-hour maritime surveillance mission. Scott Swift voices alarm about Beijing’s South China Sea behavior. Unilateral assertiveness is unacceptable in Asia, a U.S. admiral warned Monday in a speech clearly referencing Chinese behavior in the South China Sea. In a speech delivered to the annual U.S. Pacific Fleet Cooperative Strategy Forum in Hawaii on December 14, U.S. Pacific Fleet commander Admiral Scott A. Swift took aim at Chinese assertiveness in the South China Sea. With ships and aircraft subject to superfluous warnings, merchant vessels diverted after entering ‘military zones,’ and fishermen subject to intimidation, Swift – who did not explicitly tie these actions to China – suggested that Beijing was transforming the status quo in the South China Sea and eroding the rules-based system. If it continues, the prevalence of “might makes right” and the erosion of the rules-based system that has underpinned the rising tide of prosperity in the Asia-Pacific, Swift cautioned, could trigger a regional arms race. “Alarmed by these trends, claimants and non-claimants alike are transferring larger shares of national wealth to develop more capable naval forces beyond what is needed merely for self-defense, raising the risk of a sustained arc of increased regional tension,” he said. Noting that the lack of progress on dispute resolution had opened the door for instability and that there has been little progress on a binding of code of conduct, Swift suggested a few cases in South and Southeast Asia that could be applied more broadly in the South China Sea. Specifically, he mentioned the International Court of Justice’s role in resolving the dispute between Malaysia and Singapore over Pedra Branca, Middle Rocks and South Ledge in 2008; the 2012 Bangladesh/Burma case decided by the International Tribunal for the Law of the Seas; the western maritime border dispute between India and Bangladesh resolved by the Permanent Court of Arbitration in 2014. “The success of these collaborative approaches should inform our thinking on how best to resolve disputes in the South China Sea,” he said. “The alternative to such credible dispute resolution mechanisms embraced by all regional stakeholders is uncertain at best, and destabilizing at worst,” he said. Even as he sounded warnings about China’s behavior in the South China Sea that reflected deep differences between Washington and Beijing, Swift defended the need for their militaries to continue engaging with each other. As an example, Swift referred to the three ships from the Chinese navy visiting Pearl Harbor as part of an around-the-world-tour following their participation in multinational counter-piracy operations in the Gulf of Aden. “I do not see any of this as inconsistent. Like our broader bilateral relationship, the U.S.-China naval relationship must be able to handle elements of both harmony and friction,” Swift argued. “Our naval relationship, and the stakes associated with our maritime activities, are too meaningful and too important for us to avoid professional interactions just because we don’t always see eye-to-eye,” he added.